Footwork is an online course for health and wellness professionals, introducing an original technique that works through the feet to affect the whole person. It was developed by Avi Grinberg, who also teaches the course. Professionals interested in a holistic approach that unifies body and mind can practice the technique on its own or use it to complement their ongoing work. It is designed to be applied flexibly and integrated into other practices, augmenting their scope and bolstering their results. As part of Avi Grinberg’s broader methodology, based on his understanding of body attention and how we can use it to achieve better health, the Footwork technique consolidates his decades of experience focused on encouraging the body’s natural ability to recover and get well by “letting the body work”. The Footwork course provides extremely effective tools and concepts that promote physical and personal wellbeing and focus the body’s attention on healing and recovery. The Footwork technique derives from Holistic Reflexology and also draws on the conceptual framework of the Grinberg Method®. Avi Grinberg developed the practice of Holistic Reflexology and began teaching courses on the subject in Israel and Europe starting in 1986. 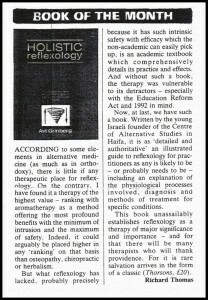 His book Holistic Reflexology published in 1989 by Thorsons (HarperCollins), was translated into five languages and is still used as part of the curriculum of a number of schools of Reflexology in both Europe and Israel. The work is renowned for its groundbreaking approach, introducing new concepts to the field of Reflexology such as personal analysis, original forms of touch, changes to the way a client receives treatment, modifications to the structure, and more. His next book Foot Analysis: the Footpath to Self-Discovery (1993, Samuel Weiser) expands on the subject of personal analysis through the feet, and was translated into nine languages. Footwork: a Footpath to Wellbeing (2015, eBook) is an in-depth discussion of the Footwork technique, including annotated case studies. In developing the Grinberg Method as a complete methodology, Avi Grinberg shifted from treating people to teaching them through their bodies. In line with this change of approach towards people’s ability to affect their wellbeing and health, he also transformed Holistic Reflexology into Footwork and taught it as a 60-hour course to professionals in a wide variety of fields. The Footwork online course is the first original product that Grinberg Method International has produced specifically for professionals in the broader field of wellness and health. Its primary aim is to offer, in a distilled and concise form, a number of essential concepts and tools developed by Avi Grinberg over his four decades of practice. It includes basic aspects of the Grinberg Method, which up until now, have only been available to and used by qualified practitioners, teachers, and trainers of this methodology. 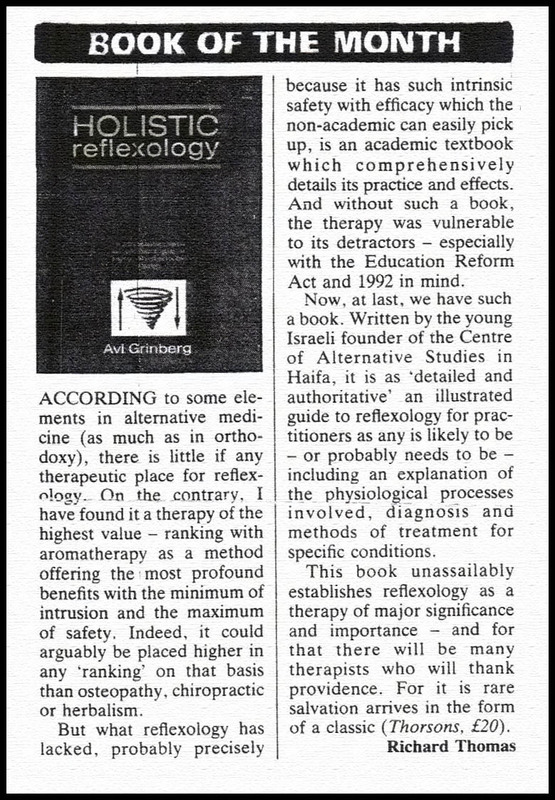 The course is taught by Avi Grinberg, developer of Holistic Reflexology and founder of the Grinberg Method. The course is based on Avi Grinberg’s 40 years of mind-body research, exploration of human attention, and practice. The technique comprises original concepts and tools developed to increase the client’s and the practitioner’s physical attention in order to change chronic symptoms, and achieve better health and greater overall wellbeing. Footwork can be easily integrated – as a whole or partially – into a broad range of therapies, bodywork methods, and other holistic healing, coaching, or teaching modalities. The course offers a Certificate of Completion upon completion of a multiple-choice test. Avi Grinberg’s journey to becoming an integrative body-mind expert was fueled by a natural curiosity about our potential as human beings to learn, heal, and grow. He began working as a healer and therapist in the mid-1970s, with an early interest in studying and refining reflexology. 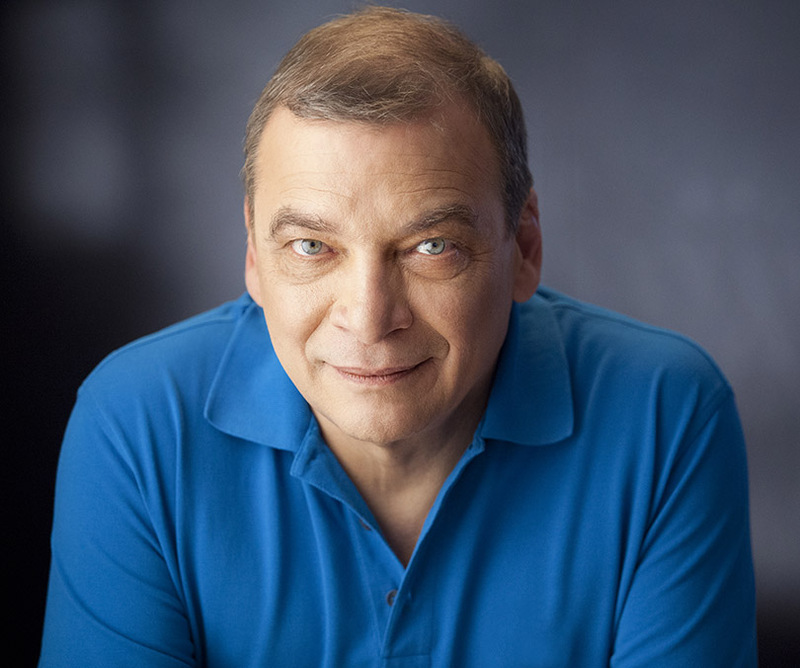 Throughout the years that followed, he continued to broaden his theoretical and practical knowledge by studying various forms of massage, bodywork, and somatic therapies, integrating these fields into his evolving body of knowledge and growing professional practice. His experience as a paramedic in the Israeli army provided an instructive and acute perspective into traditional medicine’s ability to work with trauma. To develop his own capacity for relaxation, quietness, and concentration, he practiced meditation, yoga, and martial arts. He also studied and apprenticed with ethnic healers and tribal doctors. Through these experiences, he acquired a unique overview of the broad spectrum of perspectives on how people heal. After a decade of running a successful practice, Avi Grinberg recognized that in order to heal long-term, people had to become personally involved in their own recuperation process. This realization, combined with his extensive practical knowledge and continual study and use of the feet, became the catalyst for his development of the technique of Holistic Reflexology in 1986, followed by the publication of his book of the same name in 1989. Shifting professionally from therapeutic healer to teacher, he founded the Grinberg Method® in 1991. This methodology teaches clients to identify and stop repetitive patterns that diminish their quality of life. It also addresses recovery from injury, trauma, and chronic pain through attaining a high level of body attention, allowing the body to work to heal itself. It teaches clients to realize their potential: to become more creative, to expand and develop their thinking, and to choose with greater freedom who they are and the life they wish to live. Incorporating four decades of experience teaching individuals and groups, in the fields of attention, touch, recovery, and wellbeing, the core of Avi Grinberg’s work is the understanding that people can learn to restore their body’s natural ability to heal itself. His focus is on teaching individuals how to achieve the conditions that will let the body heal in the best way possible – allowing them to achieve greater health and wellbeing. In addition to Holistic Reflexology, he is the author of Foot Analysis: the Footpath to Self-Discovery (1993), Fear, Pain and Some Other Friends (1994), which presents the basic concepts of his approach to wellbeing, and The Magician’s Call (1998), his first book of fiction. These works have all been translated into a number of languages. His latest book, Footwork: a Footpath to Wellbeing (2015, eBook), is an in-depth discussion of the Footwork technique. Today Avi Grinberg divides his time between training people to work with his method, working with his own clients, and developing online tools to make the body of his research more widely available. The Grinberg Method organization was founded in 1991 to organize and promote the activities of the Grinberg Method. Initially focus was given to teaching the professional studies to become a Grinberg Method practitioner. As of 1999, Grinberg Method International’s primary function has been to provide continuing education to the method’s Qualified Practitioners around the world. More recently, GMI has been focused on ways to make the basic concepts of the method available to a wider public. The Footwork online course is the first product of original material that Grinberg Method International has produced for the general public – specifically for professionals in the field of wellness and health. Its primary aim is to offer in a distilled and concise form some of the essential concepts of the Grinberg Method, which up until now have only been accessible to qualified practitioners, teachers, and trainers of the methodology. The company’s vision is also simply to take advantage of the cross-cultural and international dimension of the internet and online learning, in order to make this practical knowledge as widely available as possible. The technique can complement the practice of anyone who works with a holistic approach to health and wellbeing, since Footwork, with its concepts and forms of touch, can be applied and integrated into other modalities of therapy or training – augmenting their scope of practice.